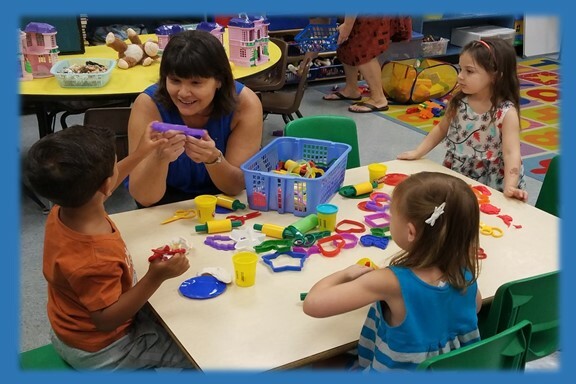 Does your Early Childhood Center operate year-round? The ECC operates 12 months per year. We close for one week in August for cleaning, teacher meetings, and repairs, as well as for occasional holidays, such as Christmas. Specific information about this can be found on the school calendar. There is availability for Before or After Care to be added for a fee of $10.00 per hour, payable to the school office. The center must have 24 hours advance notice from the parent for Before or After Care. Do your teachers have teaching degrees? All ECC teachers have at least a 99 hour certification in Early Childhood Education. Some teachers have a Bachelor’s Degree in Education. What safety training does your staff have? All ECC teachers have Infant and Child CPR and First Aid training certifications. The director and some teachers are qualified to administer medication and have taken the required classes. My child has an allergy. Can you accommodate this? We are allergy friendly by classroom. We will work with you to accommodate your family based on your child’s specific needs. How is tuition paid and when is it due? Our school currently uses the SmartTuition Program. Parents enroll their students with the front office or follow instructions using the online link. Tuition is due the 2nd of each month. Do children nap each day? Each class in the ECC is required to have a rest time each day. We provide a cot and sheet for each child. You may bring a small blanket, small pillow, and stuffed toy. Snacks are provided in the morning and afternoon. Milk is provided with snacks. Lunch is provided by the parent and water or milk is offered with lunch. Due to state regulations drinks from home are not permitted. Will the center apply sunscreen? We can apply sunscreen that is provided by the parent. On sunny days it is helpful for parents to apply sunscreen before their child arrives. Do children need to be potty-trained? Children must be potty-trained for classes Pre3, Pre4, and TK. There is a Pre2/3 class that can accommodate 2 and 3-year-olds who are not potty trained. We encourage children of all ages to have several changes of seasonal clothing in their cubby for accidents or messy projects. Classroom rules are clearly posted in each classroom so each child and parents knows what to expect. We encourage positive behavior by giving verbal praise. When needed, teachers use re-direction, reminders, and time out, as a cool down time to follow when redirection is not successful. If you have other questions, please contact our school office.